Welcome to Retro Recipes! Brought to you from the capable kitchen of Eat Me Daily's Stephanie Butler, each week we take a look at preparations from the past that straddles the line between ingenious and absurd. 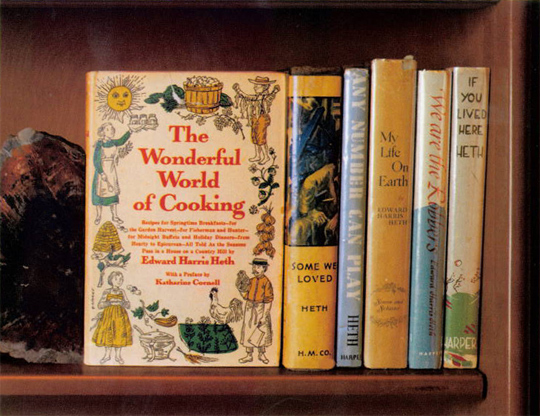 This week we turn our focus not to one recipe, but to an entire book: The Wonderful World of Cooking by Edward Harris Heth, from 1956. I found a wonderful book a month or two ago. It was a hot day at the flea market, with kids running around on the blacktop dripping ice cream onto their sneakers. I hadn't come across anything too interesting that day, apart from a wood-framed clock showing Canada geese in flight that for $10, I had to have. My friend and I were about ready to take off when I saw an old cardboard packing box filled with books, with a hand-lettered $1 sign on the front. Being constitutionally unable to pass up such a deal, I stopped to check out the box. There were a few cookbooks scattered in the mix, but one popped out. It had a corny title and a hokey colored graphic of some farm girls on the dust jacket. I had to have it. On the subway ride home, I dug into Edward Harris Heth's The Wonderful World of Cooking (buy at Amazon ). 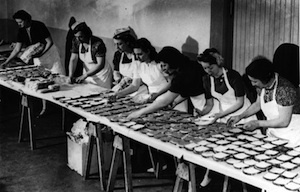 It was as if I'd found some kind of holy grail, the link between the continental-focused writings of Elizabeth David and MFK Fisher and the America-centric works of James Beard, Clementine Paddleford, and Craig Claiborne. Heth's book isn't a cookbook as much as it is a collection of food memories, tied together with an obvious love for his Wisconsin home and seasonal eating. Everyone needs a dill crock. It is as integral a part of summer as fireflies or shooting stars. You come in hot and parched from hauling weeds to the compost heap or mowing the lawn and there is the crock like a big, open, restorative fountain to dip into and fish out one of the cool, crunchy, dilly morsels of bean, onion, or cauliflouwer. It is like the tub of pickles in old grocery stores, and what has such a look of solid comfort as a lage earthenware crock sitting in one's kitchen? It is always there to plunge into elbow deep, a safeguard against life's inconsistencies, a reminder that good things endure. This unique voice runs throughout the book, which is arranged with the seasons, beginning with "The Green Spring," with recipes for Cream of Wild Asparagus Soup, Goldenrod Eggs, and Dandelion Salad. This being a Wisconsin book, there are plenty of recipes of German or Swedish origin, including Sauerbrauten and Braised Red Cabbage. Then there are old family recipes Heth lovingly describes, like Spareribs and Rutabagas and Beer Soup (a favorite of his grandmother's). But she was not without resources. In final desperation our friend went to the Plaza bar, ordered a mint julep, then tucked the fresh mint used for a garnish into her purse when no one was looking, and with a sense of triumph downed the julep, purring like a contented carrot. In fact, the mint looked so skimpy that she had two juleps, and went home feeling fine. The carrots-and-mint for her dinner that night were fine too, she thinks. As I read more, I began searching for Heth on the internet. Even if I hadn't heard of him before, surely some other intrepid yard saler with a cookbook fetish must have. But Edward Harris Heth, and his Wonderful World, have largely vanished from memory. In the 70s the book was republished as a paperback under the name Wisconsin Country Cookbook And Journal, which is more in tune with the spirit of his work, but still offered little insight into the man himself. The one lead I found was in a locally-published magazine called Penzeys One, an offshoot of the Wisconsin-based Penzeys Spice company. I ordered the issue, and found a feature article on the life and times of Ed Heth, "Wisconsin's Finest Food Writer." Heth was born in 1909 in Wisconsin, the only child of a dissolute gambler. He led a glamorous writing life in New York until poor health forced him home in the 40s. He settled down into a country house on a hill, living amongst the friends and neighbors who populate The Wonderful World. His partner through it all was a ceramicist named Bill Chancey. The two lived together openly, surely making them the first gay couple in the tiny town of Wales, Wisconsin to do so. The town embraced the pair, the article quoting one woman's take on the situation: "I remember people saying they were very interesting people and Wales always felt very honored to have them in the community." If all this sounds too good to be true for rural, pre-Stonewall America, well, turns out it was. In 1960 Heth and Chancey's house burnt down to the ground after a lightning strike. They began work on a new house, but a year later as it neared completion, Bill Chancey was found in his car with the engine on and the garage door closed. Heth tried to keep writing, even starting work on a novel, but in 1963 he fatally overdosed on painkillers. The two men are buried side by side on a sunny slope in Wisconsin's Welsh Hills. But The Wonderful World of Cooking — long out of print — is alive and vibrant, an incredible document of a man's love for his home and the food it gives him. Slice young lean carrots into thin 2'' sticks, or if they are very small keep them whole, and cook them in no more than 2 or 3 T pue butter and an equal amount of water. Cover and cook gently; sometimes it takes no longer than 5 or 6 minutes for them to become tender. Then the cover is lifted to let the emining water, if any, steam away. Salt, freshly ground pepper, and a half a dozen or more of fresh, shredded mint leaves are added along with a few crumbs of brown sugar. Saute a moment longer, shaking the pan, The mint flavor sould be elusive, so don't add too many leaves – just enough to make guests wonder what the seasoning is. Please, please tell me that's the Plaza in Madison, and please, please tell me I can still get a mint julep there. Swoon! Now that is a true jewel of a find. Thanks for sharing that, Stephanie, I really enjoyed that. You definitely right about the voice of Heth. Very entertaining. Your best column yet! I keep saying it, but I really mean it this time!! !